Sorry, but I don't care that is pretty much everywhere on my flist. I need to repost!!! But so ... yeah, Imma go there. Still together. Irgendwie kann man gar nicht anders, als mitlächeln, oder? Ich renne hier mit einem Dauergrinsen durch die Gegend :). Ojaaaa. Es ist so arg wie mich diese paar Bilder dermaßen glücklich und hyper gemacht haben. yeah our baby together smle happy. they are happy we are happy. It is just so good to see that after all the crap that was said the last couple of months, that they are still happy when they are around each other. Everybody needs to repost this!!!!! Oh yes!!! Everytime I see this reposted on my flist, it makes me smile even more. Ohhh people I love them and OMG Jared is drop dead gorgeous and he glows!!! Exactly!!! I would like to see these ppl now and do the very douchey thing to laugh into their faces. 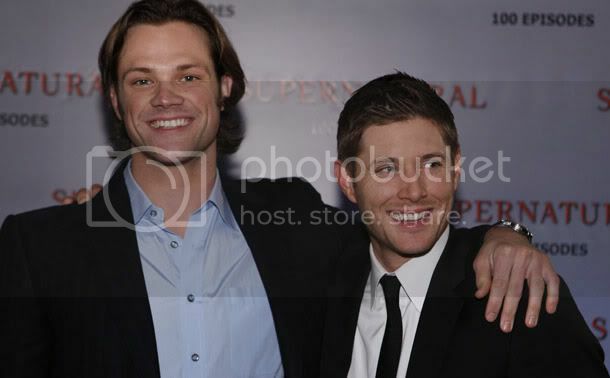 It is just so good to see them happy :-) And the outfit Jared is wearing suits him so damn well. It's def. his color!!! I haven't seen it everywhere, just here, so thank you so much! They're so adorable, I love them! Now, I am wondering how long it will last this time before ppl are talking trash about their friendship again. Es tut echt gut mal wieder solche Bilder zu sehen!! Es war schon ÜBERFÄLLIG ein neues non-convention J2 Bild zu haben. Hoffe da kommen noch ganz viele nach. It's like LJ exploded today. In a very, very good way for once!! That's why it just feels good to see this pic EVERYWHERE!! :) I hope there will be much, much, muuuuch more. Awww, die beiden sind einfach zum knutschen.